A considerable portion of the francophone population of Newfoundland's west coast, as we know it today, traces its origins back to a wave of Acadian settlers from Cape Breton Island beginning at the end of the 18th century (Thomas 1983 11). These French-speaking Acadians settled in various pockets in and around the Stephenville-Bay St. George-Codroy Valley area, and developed an economy based mainly on farming and, to a lesser extent, on fishing. Relative isolation and a family-based economy allowed them to retain, until recently, their French language and customs. 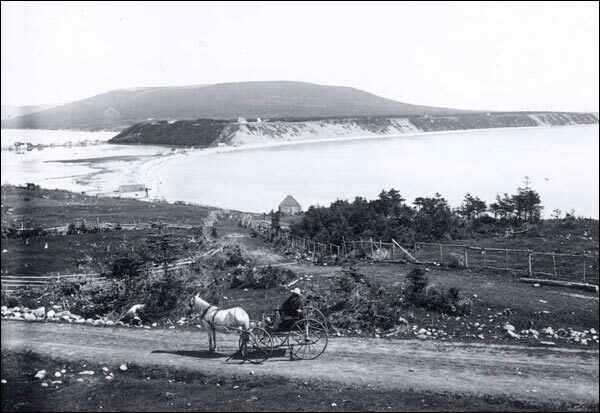 The Gravels joined the Port au Port Peninsula to the island of Newfoundland. Courtesy of Archives and Special Collections (Coll-17 04 001), Memorial University of Newfoundland, St. John's, NL. It must be remembered that during the 19th century, and indeed until 1904, France enjoyed fishing privileges along what was known as the French Treaty Shore. Some French fishermen deserted their vessels and took up residence on the Port-au-Port Peninsula. These deserters, from Brittany for the most part with some also from Normandy, Saintonge and St. Pierre, settled mainly on the western extremities of the peninsula, thus constituting a second wave of French settlement (Thomas 1977 7). There, they formed the communities of Black Duck Brook, Winterhouse, Mainland and Cape St. George (L'Anse-à-Canards, Maisons-d'Hiver, La Grand Terre and Cap-St-Georges). It is believed that the first sailor to settle in Cape St. George was Guillaume Robin of La Roche-Derrien in Brittany who arrived in 1837, while it is commonly known that the last to settle there was Yves Lemoine in 1895 (Biays 15). Unlike the Acadians further east, fishing was the mainstay for these Frenchmen, with subsistence farming acting as a supplement to their livelihood. The two groups, bound by a common language, interacted regularly. Intermarriage between French fishermen and Acadian women was commonplace. The francophone population thus continued to expand, even though schooling and most church functions, when available, were carried out in English. Hoping to guarantee a better future for their children, some French families turned their back on their heritage, and in so doing, on their language as well. Still others were nudged into assimilation by members of the clergy. For this reason, surnames such as Young, White and Bennett are as easy to find on the west coast as are Lejeune, Leblanc and Benoit. If names were not translated into English, they were given English pronunciations and spellings : O'Quinn for Aucoin (Thomas 1982 25), Lainey for Lainé and Barter for Bortheyre (Thomas 1986 25, 27). One of the greatest impacts on the French-speaking population of Newfoundland's west coast was the establishment of the American air force base at Stephenville in 1941, which attracted many English-speaking people to the area and forced those French Newfoundlanders hungry for a secure income to speak English. The advent of television in the 1960s, which of course was in English only, also contributed to the assimilation of French Newfoundlanders. For the first time, English penetrated the home, where French had always been the dominant language. Assimilation has taken its toll to the point where today few people of French ancestry in the Bay St. George-Stephenville area are still able to speak the French tongue. The western communities of the Port-au-Port peninsula were somewhat more resistant to the mass assimilation, due in large part to their isolation. ARCO is francophone association on the west coast of Newfoundland. Reproduced by permission of l'Association régionale de la Côte-Ouest (ARCO). The decline of the French language continued with the depletion of fish stocks forcing many to move on to larger centres. Despite these developments, a rebirth of interest in French culture and heritage arose in the 1960s. With the implementation of new federal government policies designed to protect linguistic minorities, the province's first francophone organization was set up at Cape St. George in 1971, under the name Les Terre-Neuviens Français. Others followed: L'Héritage de l'île Rouge (at Mainland) and Chez les Français de l'Anse-à-Canards (at Black Duck Brook). Nowadays, French-language television and radio are broadcast to francophones on the Port-au-Port peninsula, and students can receive a French-language education at École Notre-Dame-du-Cap in Cape St. George and at Centre scolaire et communautaire Sainte-Anne in Mainland. Festivals such as Une Longue Veillée and Une Journée dans l'Passé celebrate the French heritage on the peninsula and share it with the other musicians and artists who come from various parts of the francophonie, or French-speaking world. Meanwhile, in an attempt to offset the impact of assimilation and to help the community expand, literacy courses aimed at teaching francophones on the peninsula to read and write in their own language are now available, while a French-language newspaper, titled Le Gaboteur, has been in print since 1984. On a larger scale, French schools have opened their doors to students in the St. John's and Labrador regions, and in 1997 francophones in the province were granted their own school board. It is clear that the French culture and language on the west coast of Newfoundland have indeed come a long way since the early 1960s, when a former professor with Memorial University of Newfoundland's Department of Modern Languages noted at that time, after visiting the French-speaking communities on the Port-au-Port Peninsula, that there remained little trace of French culture worthy of mention and that it was indeed too late to reverse the impact of assimilation (Stoker 358). However, despite the measures that have already been adopted to preserve the French heritage and language, both unique to Newfoundland and Labrador, it is obvious that assimilation remains a factor that will continue to challenge the protective efforts of French Newfoundlanders on the Port-au-Port peninsula.